The Alliance for Solar Choice (TASC) is revving up its campaign against the Hawaii Public Utilities Commission (PUC) through its use of push polls, misleading press releases and scare tactics like the lost of jobs through carefully placed editorial pieces. Locally, any investigation to delve into TASC's tactics and use of press releases and self generated editorial content for truthiness has been absent. Hawaii's mainstream media has also been oblivious to the dissent happening within the solar industry locally and nationally due largely to TASC's tactics, leaving the public ill-informed on an issue that affects everyone's pocketbook. Table 3, on page 161 of the PUC's October 12 distributed energy resource investigation order, shows the NEM program installed capacity and enrollment far exceeding the original 2001 statutory net energy metering (NEM) system cap of .5% by more than 60 times. While it is understandable that the PUC's use of system peak was to give an apples to apples comparison of the original the NEM law to the current installed capacity, the use of system peak can be misleading to convey the urgency and need to end the NEM program to ensure reliability and fairness. In interpreting this table there are several things one must be aware of to totally grasp the magnitude of the installed or approved enrollment in the NEM program. First of all, Hawaii's system peak occurs during the evening when solar resources are not available. Therefore, in Hawaii's experience, the penetration of rooftop solar has no relevance to system peak. As circuit and system impacts have become better understood, utility planners and operators have moved to the use of daytime minimum loads to calculate system/circuit penetration and impacts. On a majority of Hawaiian Electric Company circuits, rooftop photovoltaic systems penetration exceed 120% of daytime minimum load with many at the 250% level. Secondly, the output from rooftop solar is a must take resource, that is, without technical upgrades or correct pricing signals, it is a resource cannot be easily controlled or curtailed by the electric utility. Therefore, when there is excess electricity being generated due to low demand, it is the lower cost utility scale renewable generators, or electric utility generators and independent power producers that provide baseload and regulation power to stabilize the system that are being curtailed with a possible outcome of putting the entire electric grid at risk or making the utility run less efficiently and at higher costs. But, yet, these generators and other utility resources must still be available to ramp up rapidly to meet evening peak demand. I touch a little on these types of challenges in a previous post about system limits on Molokai. These are the complex economic and technical issues that the PUC and parties to its DER investigation are grappling with to set correct pricing signals and tariffs for services to the grid to be provided by DER. Some have advocated storage as a panacea but these type of solutions must be proven out financially as discussed in this Utility Dive article, "Inside the first dispatchable utility solar-storage project in Hawaii," by Peter Maloney. Although specific to Kauai, the article gives a good overview of what is happening to our island grids with the excess generation of solar power during mid-day. But, simply put, buying excess power at the retail NEM rates and throwing into bulk storage does not make economic sense. On Kauai, utility scale solar projects (not rooftop systems) have driven the cost of solar down where storage of the excess mid-day solar power to be dispatched during evening peak hours may make economic sense, hence the recently negotiated dispatchable solar power purchase agreement with SolarCity. The Alliance for Solar Choice (TASC) in its lawsuit against the PUC selectively cites portions of state law to argue its views. However, when read in its entirety cost-effectiveness, just and reasonable rates, grid reliability and operational efficiency are huge factors to be consider allowing the PUC to adjust access and rates through applicable rules, orders and tariffs. 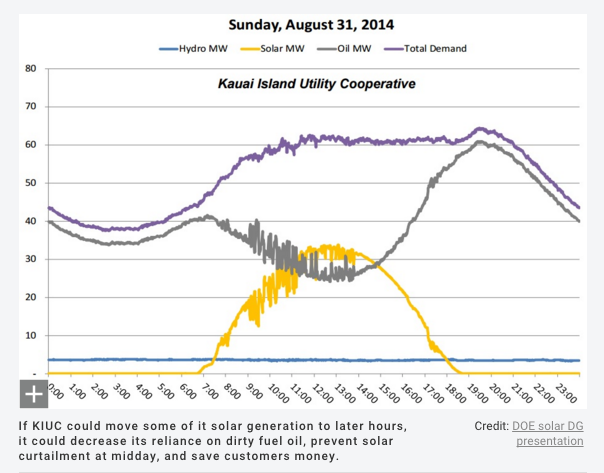 While TASC continues to argue it should be paid for the value of the electricity it produces, as Hawaii approaches the limits of its grid, with low demand during the peak solar period (10:00 a.m. to 2 p.m.) the likely value of solar could be zero or even a negative number given the infrastructure investments that will need to be made to accommodate the excess generation at retail rates. Message to TASC: careful what you ask for and you shouldn't look a gift horse (self-supply and grid supply tariffs) in the mouth. Fascinating commentary, especially in light of the comical proceedings at the evidentiary hearings. One can only wonder about the outcome of this farcical process.